This week’s Project 52 theme is “Landmarks.” My favorite landmarks are always the natural ones – the bits of earth that you can look at at know exactly where you are. Gnarled old trees, weathered stones, or in this case, one of my favorite waterfalls are all landmarks that guide us through the forest. At eight months old, I’m not sure Flint is paying attention to the landmarks as he bounds through the woods, but lucky for him, I know the way home. 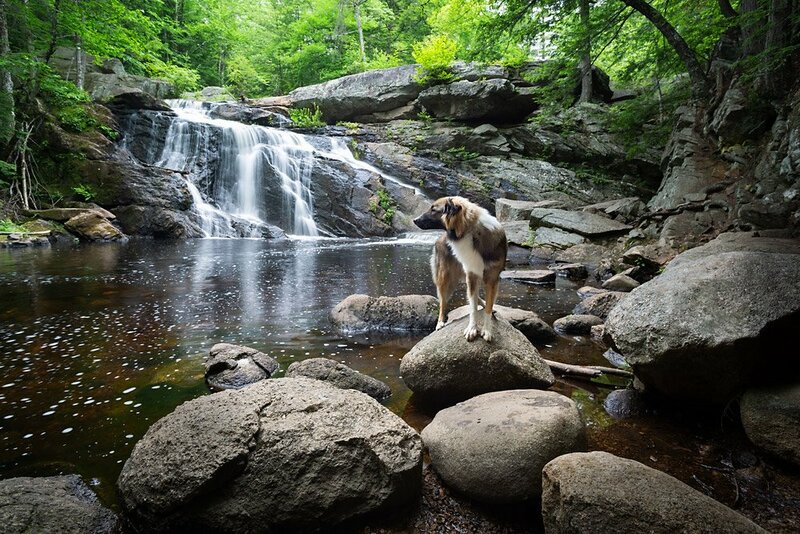 Ready to see what landmarks the rest of the Project 52 group featured in their pet photos this week? Next up is Kim with BARKography in Charlotte NC. Make sure you keep following the links at the end of each blog post to see all of this week’s photos! What a gorgeous location! I can’t believe how big Flint is now. Beautiful image. I love waterfalls as well. So gorgeous; both the scenery and Flint!